In times of uncertainty, people will help and innovate if the organisation is stable. Our paper “Does organizational formalization facilitate voice and helping organizational citizenship behaviors? It depends on (national) uncertainty norms” was published in the Journal of International Business Studies after years of analyses and writing. To be published in such a top-level journal is very rewarding and we owe colleagues, reviewers and friends for useful feedback. We had not anticipated that the world dynamics would’ve shifted to the extent that previously relatively stable countries are now experiencing their own internal and international uncertainties (e.g., G7 June 2018 and the debates around Brexit). We hope that this paper gives policy makers and organisational decision makers some key advice on how to cope when the macro-level environment is unstable but as an organisation you still want your employees to collaborate and voice ideas. Abstract: “Prosocial work behaviors in a globalized environment do not operate in a cultural vacuum. We assess to what extent voice and helping organizational citizenship behaviors (OCBs) vary across cultures, depending on employees’ perceived level of organizational formalization and national uncertainty. We predict that in contexts of uncertainty, cognitive resources are engaged in coping with this uncertainty. Organizational formalization can provide structure that frees up cognitive resources to engage in OCB. In contrast, in contexts of low uncertainty, organizational formalization is not necessary for providing structure and may increase constraints on discretionary behavior. A three-level hierarchical linear modeling analysis of data from 7,537 employees in 267 organizations across 17 countries provides broad support for our hypothesis: perceived organizational formalization is weakly related to OCB, but where uncertainty is high; formalization facilitates voice significantly, helping OCB to a lesser extent. Our findings contribute to clarifying the dynamics between perceptions of norms at organizational and national levels for understanding when employees may engage in helping and voice behaviors. The key implication is that managers can foster OCB through organizational formalization interventions in uncertain environments that are cognitively demanding. I was also nominated for ‘Most Inspiring Teacher’ for the annual Teaching Awards organised by the Middlesex University Student Union. Last year it was ‘Most Innovative Teacher’ and I’m pleased to be included in the list. What’s more, it’s a good reflective practice to read what made students nominate me. To read that I’m helpful, a mentor, that I’m feisty but I care, and that I motivate and stimulate on the subject of cross cultural management in this globalised environment is really important to me. 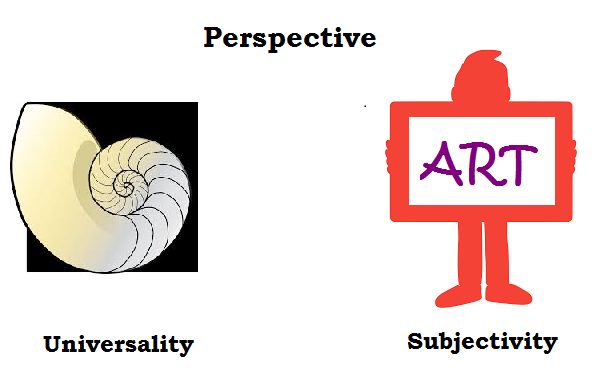 Intention and perception are key aspects to consider in academia (and beyond). The MBA student cared to do this in poem-form, which, for a business student is pretty amazing! The assiduous Dr Giroud came to Middlesex University to discuss networking for academic success, for which I, personally, was very grateful. Academics are known to be introverts and the networking aspect can be daunting. The below is a reflection of her presentation in the frame of self-reflective questions that any writer, researcher, academic can ask him/herself. These questions are my interpretation of the talk that was organised by Prof Anne-Wil Harzing and Prof Terence Jackson. What personal values are not to be compromised? What are your goals over 20 years? What do you want to achieve and how? What kind of leadership motivates you? What is the area that interests you? In what topic would you like to be (known as) an expert? What is the coherent narrative behind your (unpublished) papers? How do you want to communicate your work? How will you gain: 1) enjoyment 2) validity 3) learning? What is the most challenging aspect of being an academic for you personally? How can you develop this? An important question that is important to me personally and also in terms of as a research interest is whether we experience ‘person-environment fit’ and sense of belonging. Our environment can be the organisation but can also be our field of research or our choice of vocation. Doing some reflective exercises such as the above can help (re)focus on where we’d like to be in life. When I travel on the London underground and take an escalator up or down, I watch the faces of the people across going into the opposite direction. Usually, these faces are expressionless, on their way to something that will require some engagement but for now, on this metal vertical carpet ride, they’re in rest. I see people ahead of me getting off and I wonder about their lives, their goals and how that face is meaningful to someone somewhere. Then, forgive the morose thought, I sometimes wonder about the impact of a terrorist attack. In one blast, 100s of peoples’ lives would be ended or forever changed. I wonder how this would have an impact on those nearest to them and how community or government leaders (have to) respond. But there are so many of us. 7 billion in fact. What exactly is the impact of such a loss? When the Charlie Hebdo illustrators were killed, discussions flared up about a value of a life. For some we hold vigils, for others we just read the headline and move on. Much of this is about proximity – we care about those similar to us, near us and less so about those further away. It’s an ingroup/outgroup phenomenon that is much studied in social psychology. My work, in part, is to understand when and how people sense a belonging as part of their nation (Person Nation Fit). 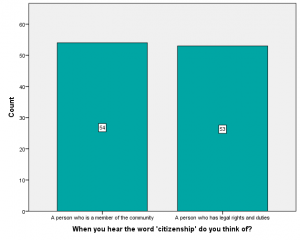 I’m currently analysing qualitative and quantitative data from people from a range of backgrounds and asked them questions about their own citizenship but also when they think someone else becomes a citizen and when the other should lose his/her citizenship. When international students were asked “When you hear the word ‘citizenship’ do you think of a person who is a member of a community or someone who has rights and duties’, the 107 who answered the question were split down the middle. When asked to explain their answer, the replies varied but one respondent who opted for ‘member’ said “More than just being in the community residing and spectating, a citizen is an active member of the community” and one of the respondents who opted for ‘rights’ said “citizen is someone who have a right in voting and sharing the benefit with other citizen [sic] within the country”. Some felt it was a combination of both: “Actually I think about both. As a citizen, a person not only belongs to a community but also has the right and duties.” For now, I’m hypothesizing that the former (member of a community) definition is more tribal, linked to a sense of belonging whereas the latter (rights & duties) is transactional. In our globalised world, migration is a hot topic, despite the fact that humans have been moving around for as long as we can track back records. Perhaps we are more bothered now, since the volumes of people have grown. Yet, I doubt many of the people who ride the escalator up or down think about their citizenship much, unless they’re in the process of pledging their allegiance, if they’re a refugee/asylum seeker or if they’re about to migrate elsewhere. I’m unsure the majority can remain ‘laissez faire’ about migration, in that, if we’re not opposed to it, we cannot choose to remain neutral. If I invite you to my home, I show you where the kitchen and bathroom is. I don’t let you get on with it and figure it out so you make mistakes and then I get annoyed, especially if you brought your husband and parents too. One needs to invite the other to the proverbial fire, sit with them, share with them. The rules of pragmatic multiculturalism have changed and that requires engaged and culturally intelligent management. Cross cultural management is the ability to handle issues between people from different backgrounds effectively. In our current globalised environment, any individual with responsibility over or for others, i.e., a leader and decision maker, would do well to take heed of the cultural differences that exist but it can be a minefield . We are never neutral, and all that we perceive is through a filter coloured by our cultural background. However, it is also often ignored by people in leadership roles because the benefits of training can be difficult to translate into a hard cost-benefit analysis and it goes against the general idea that we live in a global village, where modern people think similarly and where there is no need for understanding cultural differences. that Iraq was a sea. which no one can push out to sea. Time, perspective and remembering to take in the here and now, here is an interesting video to realise that: “The birthday of the oldest person on earth is closer to Napoleon than to 2014” http://lnkd.in/dfEMEgm and we need to be in the moment to enjoy life. Twitter allows us to find information quickly and catch up with the latest news, innovative developments and (mass) opinion. I use it as a search engine, especially if I don’t want to be searching through links from 2006 or before. Nothing can be more frustrating than entering ‘(comedian’s name)’ or ‘(conference name)’ for information on (tour) dates, to then get a link from three years ago. However, the convenience of fast searches and scrolling through tweets, FB posts etc quickly can obstruct deeper learning if we don’t engage with what we see. True, this costs time and we’re all busy. But take this photograph. It was on Twitter and links to an exhibition on bottled water. The image is shocking in terms of poverty. But it’s also a warning about the mountain of plastic bottles we’re accumulating. Finally, could it be used as an extreme example of innovation to wake up a student audience sliding into a slumber? Similarly but different, the journalist Mikey Kay has been criticised for the lack of professionalism when reporting on Syria (review in Dutch but tweets in English to get a flavour). Kay is accused of being a caricature of the journalism profession in his report on the Mid East. Indeed, Kay’s tweets hover between James Bond wannabe and genuine observations. So we could put the video aside as inadequate. But reports on the Mid East, critiqued by journo/anthropologist Luyendijk in his book People Like Us, are perhaps a little one sided. After having watched the video and as someone who has visited Beirut several times, I think that ‘serious’ journalism doesn’t always have to be morose. This video by the former military pilot may be a poor attempt at highlighting that the situation in Syria is serious but, actually, it also functions as an insight into Beirut’s nightlife thus lifting the veil on the usual stereotypical perceptions Lebanese people have to deal with on a day to day basis. It could make some who viewed it reconsider the entire Mid East as a deserted war zone. I mean, who knew that they celebrated Halloween in Damascus? The Syrians remember, and if we empathise, hopefully their world can get back to normal. I had a meeting with our University’s Dean of Law to discuss my novel on human smuggling. We also discussed Syria, which he described as “Hell on earth”. Bombing indisciminantly is not a solution, also due to the complexity of allegiances/role of Iran/oil, so beware what you vote for. He questioned usage of the 2007 Resposibility to Protect militarily. The Mid East is bursting at the tension seams and intervention by the US/EU adds fuel to fire, as much as it would annoy Putin. It may be that the opposition (Free Syrian Army vs Al Nusra??) 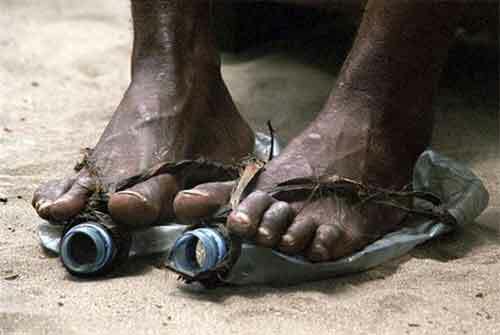 and Syrian gov need to fight it out and the world must provide aid to refugees. But it is a disaster. Factsheets on aid make it clear how much is spent already and how difficult it is to reach people (EU commission Syria factsheet). Za’atari camp is an example of the misery (newyorker.com) BUT, controversially, the Jordan villagers nearby sees aid arrive while they live in poverty (irinnews.Org). Knowing who to donate to is difficult. Mercy Corps tries to help refugees specifically and focuses on the local impact, but there are others too (if you prefer a religious org for example). I donated to the Red Cross per advice from a friend in Lebanon as the RC is non-political but again, you may believe in smaller local aid organisations. There so many more humanitarian issues, I know this. I care about the environment and welfare of animals too. So why? Because there are 2 million refugees outside Syria, half of them children, and 4.5 million displaced within the country. That is approx 30% of the population or Paris plus Los Angeles. The resolution of this tragedy requires collective efforts at (inter)national, organisational and individual level by humans for humans.